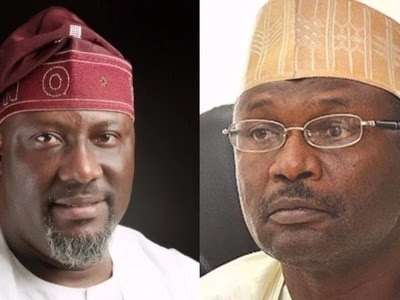 A center for transparency advocacy, the Independent Service Delivery Monitoring Group (ISDMG) has sounded a note of caution to those who are trying to drag Chairman of Independent National Electoral Commission (INEC), Prof. Mahmoud Yakub into the fate of the recall process initiated against Senator Dino Melaye. Melaye is facing a recall process initiated by his constituents from the Kogi-West senatorial district who had approached INEC with signatures which are purported to have met the constitutional provisions in that regard. Addressing a press conference in Abuja, the Executive Director of ISDMG, Dr. Chima Amadi call on Nigerians to be concerned about the attempt to ridicule national institutions and individuals who by carrying out constitutional mandates of their public offices are at the crosshairs of some powerful individuals. The group recalled that reports popularized by the social media tried to insinuate that the INEC has halted the process of recall of the Senator because of the emerging revelations which shows that the chairman of the commission might have soiled his hands with corrupt practices amounting to about N850 million while he presided over the affairs of the Tertiary Education Trust Fund (TETFund) between 2007-2011 that Senate has resolved to revisit. Checks however indicate that, INEC through a press release debunked the reports regarding such as the figments of the imaginations of the authors and have also informed the nation that it rightly obeyed the pronouncements and orders of a court which the Senator had approached to halt his recall process. “The ISDMG's advocacy thematic area in the last 10 years has been on good governance with focus on the assessment and monitoring of service rendered by public institutions. While engaging with public institutions, the Group normally interacts with the actors that are saddled with the responsibility of leading agencies of government. The TETFUND under Prof. Mahmood was one of those agencies we vigorously engaged with”, it stated. ISDMG also says it relied on the Freedom Of Information (FOI) law to dig and bring out facts and figures around the matter long before Mahmood became the INEC chairman. While displaying various documents from impeccable sources, the group said they are of a firm belief that Mahmood did not get himself involved in any illicit financial deal to warrant such attacks. “Upon assumption of office as Executive Secretary of ETF (as TETFUND was then known) Prof. Mahmood received a letter from the Universal Basic Education Commission (UBEC) asking for the release of the sum of N850 million representing second tranche allocation for a 2005 intervention granted it by the ETF for the supply of pupils desks and seats. “Before he could authorize a disbursement of such sum and in line with civil service best practices, Prof. Mahmood peered into the files and records and discovered glaring due process infringements in the administering and utilization of the first tranche. “He wrote back and requested that the UBEC properly accounts and retires the first tranche and institutes the process of complying with all due process procedures before the disbursement of the second tranche could be undertaken. The management of UBEC agreed to comply with this request and instituted the process to that effect. This signalled the beginning of a long legal tussle. “The company that poorly executed the contract for the first tranche approached the courts to halt the process of compliance with due process claiming that it had an irrevocable exclusive right to be awarded the contract for the second tranche. It got an Abuja federal high court under Justice A. Abdul Kafarati to order the TETFund to pay into a court administered account the entire sum of N850 million pending the determination of the substantive suit. “Prof. Mahmood's TETFund disagreed with this order and challenged it in the court of appeal where the court asked for the status quo to remain. The money remained in the custody of the TETFund”, ISDMG emphasized. While recalling another media report, the group informed that when the allegation first emerged, the media organisation after deeper investigation retracted the statement and tendered an unreserved apology to Mahmood. “It is noteworthy to inform everyone that just two years ago, the management of UBEC and the company came to an out of court settlement and reverted to carrying out the earlier condition of complying with due process as directed by Prof Mahmood 10 years ago. “The BPP has since issued a certificate of due process compliance for the project, the contract awarded and the fund released for the execution of the project. All these actions taken years after Prof. Mahmood had left office”, it noted. ISDMG said, if the Senate is performing its oversight functions to probe the activities of the TETFund, it should be encouraged just as it suggests that such constitutional responsibility should not be reduced to a wild goose chase or personal vendetta. “In saner climes, national icons in public service are celebrated but in our society where every good person or work must be destroyed in the name of politics, it's time we start calling out these destructive elements in our polity to protect the few good men who still believe in project Nigeria and have dedicated themselves to a life of service. “Certainly, the recall process will go on and the ISDMG having already applied to INEC to monitor the process will do just that to ensure that fairness and compliance to the rule is guaranteed and justice is not only done but is seen to have been done”, it concluded.